For the 21st edition of the race, Santini will once again be an official partner of the Santos Tour Down Under Stage Race. For the 21st edition of the race, Santini will once again be an official partner of the Santos Tour Down Under Stage Race. First held in 1999, the Santos Tour Down Under is the biggest cycling race in the southern hemisphere and the first event on the international UCI World Tour calendar. This 11-day event brings UCI World Tour professional cycling teams to race on the streets of Adelaide and regional South Australia each January. Up for grabs are important UCI points and the prestigious Ochre Leader’s Jersey. The event also plays host to a UCI Women's 2.1-grade event, which brings some of world’s top cycling teams to Adelaide. As official clothing supplier Santini will provide the three official race leader jerseys: the Ochre general classification leader jersey, the polka-dot King of the Mountains classification leader jersey, and the red Sprinter classification leader jersey. In addition, there is a new limited edition cycling kit designed by the santini creative team, dedicated to the 2019 race. 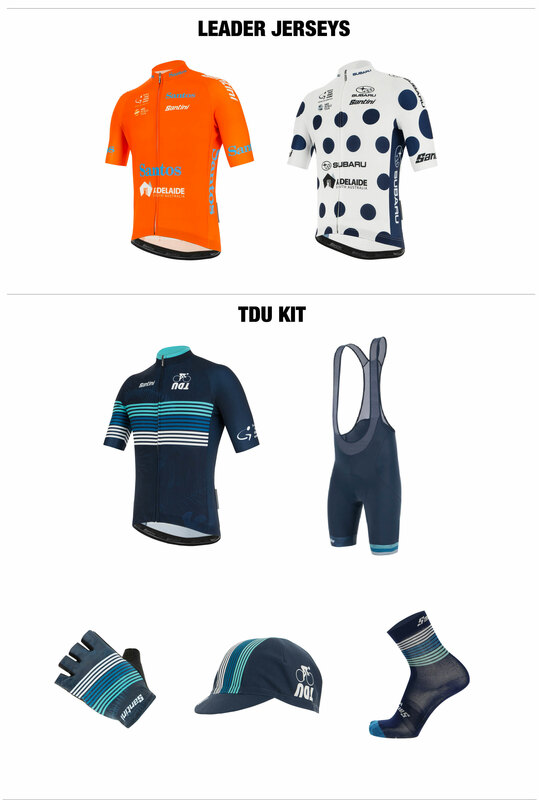 Get your new 2019 TDU kit now!